Surely, they’re pretty open about that fact that they’re doing this for everyone’s own good -_- each algorithm tweak brings us one step closer to more relevant search results, after all. However, there is still some secrecy behind exactly how Google evaluates a website and ultimately determines which sites to show for which search queries. These tools are critical to your organic search strategy because they allow you to focus on the elements of your site that Google deems important. Another great feature of Google Webmaster Tools is PageSpeed Insights. This tool measures the performance of both your desktop and mobile site in terms of speed. With mobile search queries surpassing desktop searches, page speed is becoming increasingly important to businesses that want to hold on to their visitors. “The PageSpeed Score ranges from 0 to 100 points. A higher score is better and a score of 85 or above indicates that the page is performing well. Please note that PageSpeed Insights is being continually improved and so the score will change as we add new rules or improve our analysis,” according to Google Developers. To ensure that your links on a webpage – whether external or internal – actually work, check out Check My Links. This broken link checker makes it easy for a publisher or editor to make corrections before a page is live. Think about a site like Wikipedia, for example. The Wikipedia page for the term “marketing” contains a whopping 711 links. Not only was Check My Links able to detect this number in a matter of seconds, but it also found (and highlighted) seven broken links. 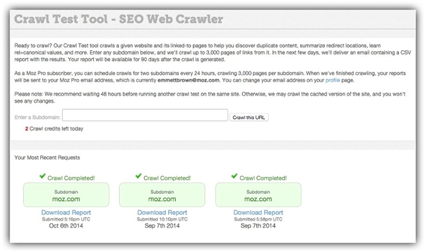 For example, the Crawl Test tool employ’s Moz’s own web crawler, RogerBot, to analyze up to 3,000 links on a given URL. Once completed, users then receive an email report that details the data for each page the site links to. This is super helpful if you’re looking to identify crawlability factors such as duplicate content and redirects that could be influencing your SEO performance. Rank Analysis. A snapshot of where your website ranks on Google, Yahoo, and Bing! Your ranking is based on the main keyword you selecting when putting information in to build the report. Back in 2007, HubSpot released a tool called Website Grader that helped businesses uncover search engine optimization opportunities. Since a lot has changed since then, they recently released a new and improved version of the tool. Performance. They look into your site’s page size, requests, speed, and then some. Mobile Readiness. They check to see if your website is mobile-friendly in terms of responsiveness and viewport settings. SEO. They determine if your website is easy to find — by both humans and bots. This determination will take factors like page titles and meta descriptions into consideration. All you need is your website URL and an email address to get started. Simply plug in your information and you can expect a score (1-100) as well as a detailed report in just a matter of seconds. While you’ll never get a look behind the Google curtain to learn everything they know (or don’t know) about your site, by leveraging SEO best practices and getting the most out of tools like those listed here, you can greatly increase the chances that your website will show up in response to the right search queries. Arslan is working as Internet Marketer since last 2 years. He also work as Graphic Designer at code desk.